Daffodils have popped up all over my neighborhood the past few days, but none of them says Spring to me as much as this single crocus that I spotted in a neighbor’s yard last week. Backgrounds are always a big problem with flowers this early—it’s hard to avoid having mulch or fallen leaves in a shot. For this shot I used my 180mm macro lens and a really shallow depth of field. I like the softness that the settings gave the edges of the flower, while the center on which I was focusing was pretty sharp. 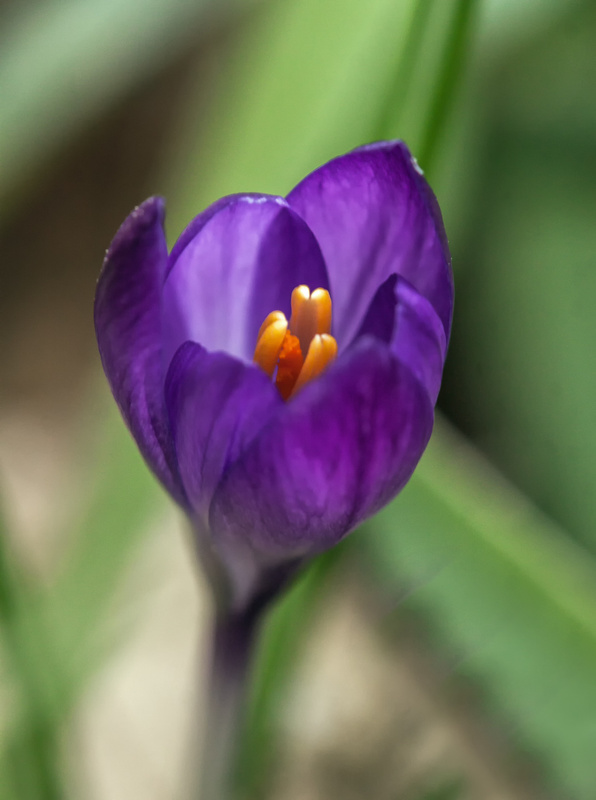 Your photo, just like this single crocus, is simply beautiful! Thank-you! Great shot, Mike. I love seeing these guys pop up. that is the most beautiful crocus photo I’ve ever seen and I have seen a lot of them. Thank you. Thanks so much, Ann. One of my favorite approaches in photography is to try to capture images of ordinary subjects in ways that highlight their extraordinary beauty. Photography to some is merely about capturing reality, but it can actually be a whole lot more than that, because a photographer often makes a series of creative choices that affect what the final output. A beautiful sign of Spring! Indeed. I love the simple beauty of crocuses even more than tulips and daffodils. Thanks, Robert. it is always interesting to get a sense of how others view my photos. There is no way that I can possibly look at my own work objectively. Thanks, Louella. Personally I am always drawn to simple beauty. A beautiful image, Mike, and a lovely reminder of simplicity is often best!